The airfield was built as a result of the U.S. military seizing land upon which a village was located while its residents were isolated in internment camps during and after the war. Neller’s comment ignores the sequence of events that led to the residents having no choice but to live near the airfield. At this press briefing at the Department of Defense, Neller answered a question from the Ryukyu Shimpo. Neller said, “… I know the great majority of Okinawan people appreciate the American presence there, and that the great, great majority of us are good neighbors and we’re good friends.” As for the issue of Futenma relocation to Henoko, Nago City, Neller said, “We are happy to leave Futenma when we have a place to leave to go to. Until then, we’ll continue to operate and be as safe as we can.” With these words Neller made known that the plan is to continue to use Futenma Air Station, negating that Futenma be closed down next February in accordance with the five-year period that the Okinawa Prefectural Government requested from the Japanese government. 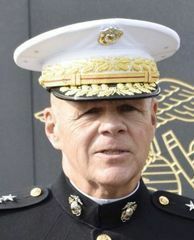 Neller confirmed that the plan to reduce the number of Marines on Okinawa remains unchanged. However, he addressed the opposition movement and said, “The Futenma Replacement Facility is going to take awhile.” He once more expressed the view that environmental issues are standing in the way of the Marine Corps plan to build live-fire ranges on Tinian Island in the Mariana Islands, upon which the plan to relocate Marines to Guam is consequent. There were reported incidents of lasers being pointed at aircraft around Futenma, Kadena, and elsewhere in 2015. Also, when Osprey aircraft were deployed to Okinawa in 2012, residents of the surrounding areas flew kites and balloons to demonstrate their objections to the deployment, but now these actions are restricted.